Arizona Landlord Tenant Blog: Are there any laws that address the issue of a rental property going into foreclosure? Are there any laws that address the issue of a rental property going into foreclosure? Yes. 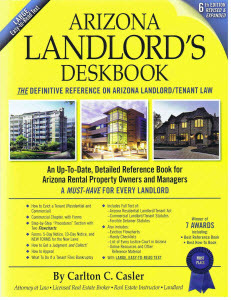 The Arizona Residential Landlord and Tenant Act was amended in July 2010 and a new statute was added – A.R.S. Section 33-1331. In short, the statute says that if a rental property is already in foreclosure, then the landlord must inform the tenant of this fact before the landlord enters into a new rental agreement with the tenant. Under this new statute, it is clear that the landlord must disclose the foreclosure before entering into a new fixed term lease with a tenant. That would apply to a brand new tenant (whether that tenant is signing a new fixed term lease or a new month-to-month lease) AND to an existing tenant who will be signing a new fixed term lease. What is not clear is whether it applies to a month-to-month agreement that existed before July 2010 (when the statute became effective), which renews automatically each month (until/unless canceled by one of the parties) and that continues to renew automatically after July 2010. Similarly, it is also unclear whether it applies to a fixed term lease that began before July 2010, but has expired (either before or after July 2010) and now continues on a month-to-month basis. Outstanding post, I believe people should learn a lot from this web blog its very user pleasant. My wife and I have been renting a home in Mesa Arizona for nearly 3 yrs through a real estate company. Today we were notified that the owners of the home were going to give the home back to the bank. Our lease is up in October 2011. What are our rights, do we need to keep paying rent and should we expect to receive our deposit back so we can find another home? Response by Carlton C. Casler. Yes, you need to keep paying rent. The question is to whom do you pay the rent? You are within your rights to demand written proof from anyone demanding payment of rent that the person owns the rental property. If the house is sold at a foreclosure sale, the buyer will have either a sheriff’s deed or a trustee’s deed. If the owner gave the property back to the lender, then the lender will have a deed-in-lieu of foreclosure or perhaps must a quit claim deed. Look at the copy of the deed you have been given. It should be recorded in the county where the property is located. Go to the county assessor’s web site to ensure it was recorded. If true ownership is still in doubt and you are a “bona fide” tenant with a “bona fide” lease (under the "Protecting Tenants at Foreclosure Act of 2009"), then wait for the “owner” to file an eviction lawsuit. The Act allows a tenant who is being evicted for nonpayment of rent to pay the rent into court. (See ARS Sec. 33-1365). Pay the rent into court and file an “Answer” to the “Complaint.” Make clear in your Answer that you are ready, willing and able to honor the existing lease and to pay rent to the proper owner, but that the putative owner has failed or refused to provide you with evidence that they are the current owner and/or entitled to collect the rent. Sec. 33-1365 allows the court to direct payment to the proper party and, if the tenant has acted in good faith, the court can also declare that the lease has not been terminated and that the tenant may remain in the property until the end of the lease term. As for your deposit, the "Protecting Tenants at Foreclosure Act of 2009" does not state whether the old owner or the new owner is responsible for the existing tenant’s deposits. Some states have enacted laws that provide the new owner is deemed to have received all refundable deposits and that the new owner must return all refundable deposits to the tenant after tenancy terminates unless the tenant has caused damage to the rental property and/or owes the owner for other amounts. Arizona has not yet enacted such a law and it is not clear whether the new owner is responsible for the tenant’s deposits. Clearly the former owner has liability for the deposits, but if the former owner lost the rental property to foreclosure, you can assume that the former owner does not have the funds available to return your deposits. I wouldn’t count on the new owner giving you your refundable deposits, but there is no harm in asking the new owner. As for getting your refundable deposits before you actually vacate (so you can afford to move), that is unrealistic. You may, however, be able to convince the new owner to give you “cash for keys,” whereby the new owner pays you some amount of money in exchange for you vacating by a certain date and/or some other specific conditions. My sister rented 1/2 a house two months ago on a month to month basis. The owner left for England for a month. She came home the other day to a notice that said Fannie Mae now owns this house. It said she had three days to leave and then they were going to change the locks. She did not want to get in the middle of anything, so she just left. He still has her deposit, and claims she had no right to leave without notice. It is obvious he is not aware of A.R.S. Section 33-1331. What is the process when someone breaks a statute such as this. Is it a civil matter for which she can sue him in Small Claims, or should she file a complaint with the Attorney General's Office? thanks for any info you can offer. Response by Carlton C. Casler. If FNMA now owns the property, then the former landlord has no right to evict your sister. She may have been able to stay, but I don't have enough facts to know for sure and, in any event, she has already moved out. Yes, your sister can sue him in small claims for her deposit, but she should send him a written demand for return of her refundable deposits. If he does not return her refundable deposits within fourteen business days, then she should wait another week and then file in small claims court for return of her deposits AND, in addition, TWICE the amount of her deposit. (See ARS 33-1321(D)).